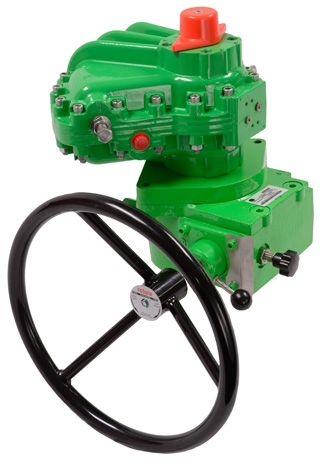 K-TORK offers a de-clutch gearbox manual override that mounts between the actuator and the valve to provide for manual valve operation in the event of air failure or for emergency operation. Under normal automatic operation, the gear is disengaged and the actuator turns freely to operate the valve. The manual override will remain attached to the valve to hold the valve steady or to open / close the valve with the K-TORK actuator removed for maintenance or repair.